In fact, Our Lady of the Inferno has the honor of being the very first book published under the brand-new Fangoria imprint. I originally reviewed the book here, so give it a read and then pre-order this insane tale of vintage New York City grindhouse madness. Fassel says: “The thing about the cover, what I love about it, is that it achieves this amazing, simultaneous task of being very aesthetically beautiful, capturing the ambiance of the era, and also conveying the mood of the book… it looks how the book feels to read. You pair that cover up with Blue Oyster Cult’s Burning for You and it conveys something very profound about the experience of Our Lady of the Inferno; and I hope that for anyone who reads it, it’s just that — an experience. “It was certainly an experience for me to write. It’s the kind of story I’ve been trying to tell since I was eighteen, spending Friday nights marathoning ‘80s horror flicks and grindhouse movies I’d rent from Hollywood Video or the local grocery store. That sort of dichotomy is represented in the book — my heroine, Ginny, with her simultaneous sweetness and savagery, her poetic soul and her constant striving for something better, is very much a product of the 1980s, a very take-no-prisoners woman who isn’t going to let the fact that she’s essentially been forced into prostitution get in the way of her dreams or her 140 IQ. And then Nicolette is a relic of the savage ‘70s — she may be steeped in the social developments of the 1980s, but she’s essentially an anachronism, a cold-blooded killer who sees the streets of Manhattan the same way a hunter sees a game reserve. She’s got the atavistic mindset of survival of the fittest, the sort of institutionalized psychopathy that sort of defined a lot of the culture of the 1970s. And then you see that, too, reflected in the cover art — this combined beauty and decay. 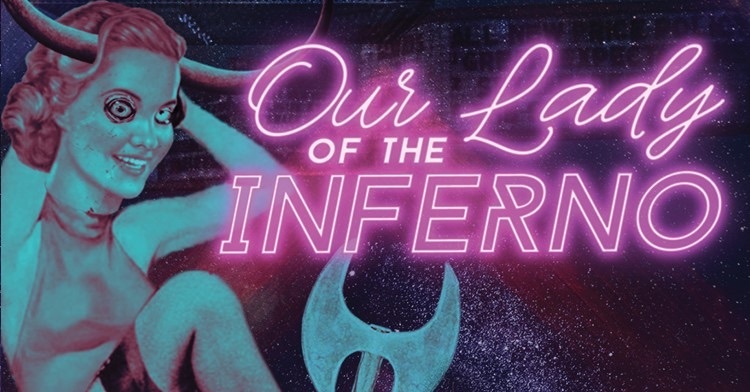 The cover for Our Lady of the Inferno is a beauty to behold, and just hearing Fassel’s description makes me want to revisit the deliciously gritty, grimy underworld he’s recreated. What do you think of the cover?